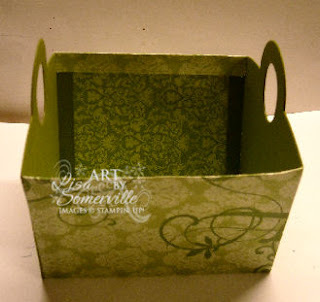 Designs by Lisa Somerville: Three Clover Thursday - Use it Up! Three Clover Thursday - Use it Up! Time for another Three Clover Challenge from Kerry! This weeks challenge is Use it Up - use 2 different papers that you have had in your stash for at least a year. I'm pretty sure my beloved Brocade Backgrounds DSP qualifies - I did cheat a bit, as I used two pieces from the same package! I hadn't created my project early, so when my mail came today, I was thrilled to get a goodie box from my friend Robin! She sent me a bunch of alterables (which I'll be putting to good use) and the cutest basket made from pieces of Stampin' Up! 's Basket & Blooms Die, she said she had found the idea here - but she too altered it a bit to work for her. I used the basket she sent me as inspiration to create my own basket. Changing the dimensions a bit to make a smaller basket, and altering it to fit my needs. I've created a little tutorial to help you recreate the size basket I made. Cut 4 basket pieces from card stock - these will be the sides of the basket. Tape two together so you have a fold on each side. Adhere Sticky Strip to each fold. Repeat with other side pieces. 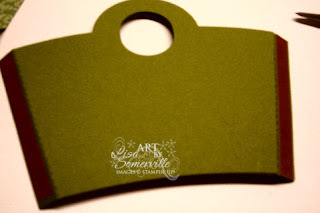 Remove backing from Sticky Strip and attach basket pieces to scored card stock as shown. I found it easier to attach mine this way, then fold up the other flap of DSP and attach to the remaining basket sides. In this photo (click to enlarge) you can see the small flap of DSP that I folded down - you can have this fold outside your basket - or to the inside as in my finished view. The reason I choose to have that small flap was to add extra support to the edge to the basket rim. Here's what my basket looks like once it's assembled, and the flap is folded towards the inside. To finish my basket - I cut two strips of Brocade Backgrounds DSP, scored them and used the Eyelet Border Punch on the edge, then folded my flap over and secured them to my basket. The butterfly was created by running a scrap of Olive card stock through the Damask Texturz Plate (be sure to spritz your card stock first, you'll get deeper impressions), then cut with the Butterfly Die. I used my sponge dauber and Olive ink to highlight the embossed areas. I added some Silver Gems, then secured it to the box with Glue Dots. The tag on my cello bag was created with the new JustRite Celebrations Demi Phrases and Wood Stamper 2" with Bonus 15pt. Font Set & Center, the Martini Glass is from Vap! Scrap. On my block - you'll notice I trimmed the excess from my Demi Phrases (the are next to the "H and the U") so any excess ink would not transfer to my card stock. You'll also notice that there are two rings on the 2" Block so you could use the 15pt. Font to add extra text. For this particular project, I only used the "enjoy!". 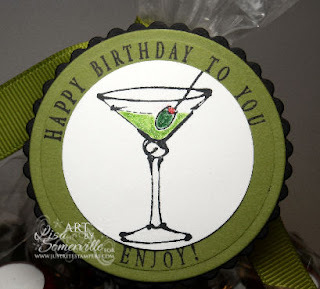 The Martini Glass was stamped in Black on White card stock then cut with the 1-3/4" Circle punch then colored with Spica Glitter Pens. 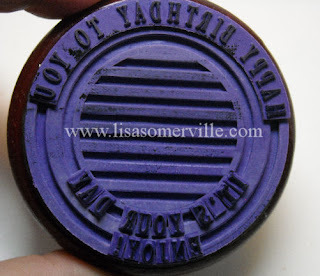 I stamped my JustRite Stamper in Black on Olive card stock and cut with my Circle Nesties, then layered on a piece of Black card stock that was cut with the Scallop Nesties. 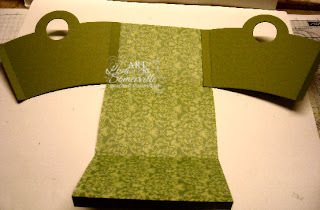 Be sure to stop by Kerry's Blog to see what the other members of the Three Clovers Inspiration Team created today! Thanks for stopping by - if you create one of these baskets, leave me a link, I'd love to see it! So clever GF! What a nice gift that makes! Lisa this turned out great and what a fun little gift. Love that martini glass image. wow!!! what a great use of that die!!! wonderful tutorial! Thank you for the wonderful tutorial, Lisa! The basket is so cute! Love the papers you used! WOW! What an awesome gift!! this is really SUPER, Lisa! I really like that "old" paper and all your wonderful details. Thanks so much for the great tutorial! Great project! Love the end results. 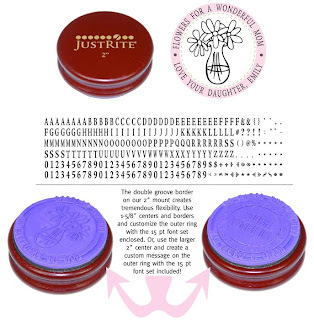 Those darn Just Rite stamps are high on my list of stamps to buy...they are just neat! Wow, what a fun and creative project. How fun is this, Lisa! 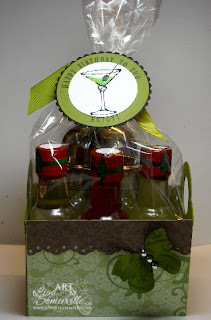 LOVE the martini glass too! Love this!!!! What a fabulous gift. Very creative lisa!